Your wrists allow you to have full movement of your hands. Within your wrist, you have ligaments that help provide stability in movement. If you suffer a wrist injury these ligaments, you may lose normal mobility and may also experience pain and swelling. Healthy wrists and hands are vital to an active lifestyle. Repetitive strain can often cause chronic wrist pain. 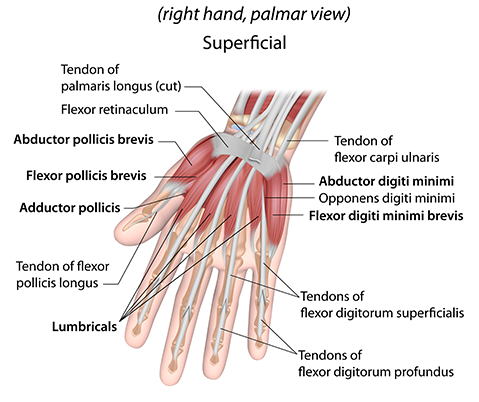 The carpal canal is a closed space located within the mid-area of the palm side of the wrist. It is covered by a thick ligament known as the volar carpal ligament. Inside the tunnel-like enclosed space courses the median nerve and the flexor tendons. It is theorized that because this is a closed space, as pressure builds up with repetitive movements, problems occur and pain is an inevitable result. The patient will feel a numbness and tingling in the areas that are supplied by the median nerve, which runs through the thumb, the index and middle fingers, and through half of the fourth finger on the thumb side. The patient may also experience a weak grip and a loss of fine movements. OUR PHYSICIANS WILL EVALUATE YOUR HAND OR WRIST INJURY TO DETERMINE IF YOU ARE A GOOD CANDIDATE FOR WRIST OR HAND SURGERY. In some cases, physical therapy and exercise therapy may improve your condition without requiring surgery. The first step is to have your wrist or hand evaluated by a physician. The physician will consider your symptoms and conduct a physical exam to evaluate your wrist or hand’s strength, stability, and range-of-motion. X-rays, MRIs (Magnetic Resonance Imaging), and additional tests may be required to show internal injuries. Based on your examination, your physician will let you know if surgery is necessary or if exercise (whether at home or through an external physical therapy facility) would suffice to improve your wrist or hand’s function. EMG (Electromyogram) – Your physician may use electrodes to check the nerve pathway and muscle function. These electrodes are painless and have no continuing effect. THE RESULTS OF YOUR PHYSICAL EXAMINATION AND TESTING WILL DETERMINE WHICH SURGICAL PROCEDURE, IF ANY, WOULD BE NECESSARY TO RESTORE OPTIMIZED FUNCTION. With just a few, small incisions, your orthopedic surgeon will cut the transverse carpal ligament and relieve pressure on the median nerve. The procedure is normally done as outpatient surgery and takes approximately 30-60 minutes. Your physician may give you a splint to keep you from flexing your wrist. 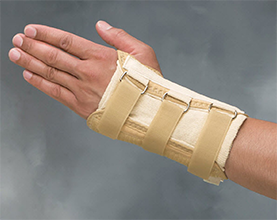 Since flexing can make your symptoms worse, the splint will keep your wrist in a rigid, straight position. Your splint may be worn during the day and/or at night. Relieving the stress on your wrist will relieve swollen tissues. At the same time, your physician may prescribe medications to aide in your recovery and ease your pain. Do not exceed the amount prescribed without first receiving approval from your physician. Exceeding the prescribed dosage is dangerous and can lead to numerous health hazards and even death. Your physician may suggest cortisone injections to reduce inflammation in your wrist. Some patients may only require one injection, while others may need additional injections to relieve pain and inflammation. Exercise and Physical Therapy Physical therapy and/or home exercise may be suggested by your physician.  These exercises are designed to slowly strengthen your wrist and increase its  range of motion. The speediness of your recovery will greatly depend on how  dedicated you are to following your physician’s recommendations. Your  physician may also suggest that you use a sling until your wrist is stronger. Are you suffering from hand pain? Trying to overcome a wrist injury? Get treatment today! Lake Pointe Orthopaedics offers surgical and non-surgical options to help alleviate your pain.